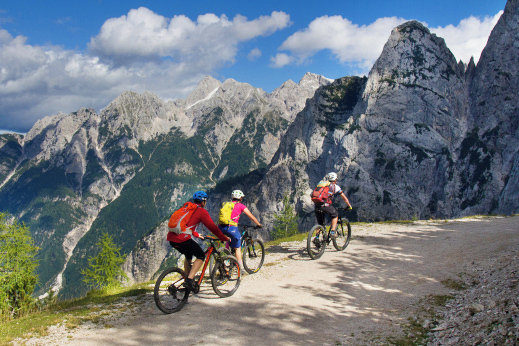 Enjoy a week-long mountain biking tour in Slovenia, Europe’s best-kept secret. 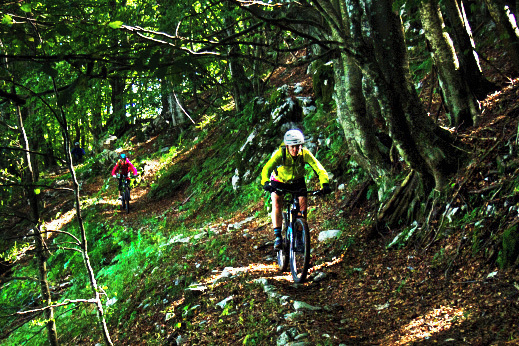 Experience amazing mountain bike tracks in pristine nature and join us on an epic journey from the Julian Alps to the Adriatic coast. Visit Ljubljana, the vibrant capital of Slovenia where you can warm up on the singletracks that crisscross the forested hills surrounding Europe’s Green Capital of 2016. 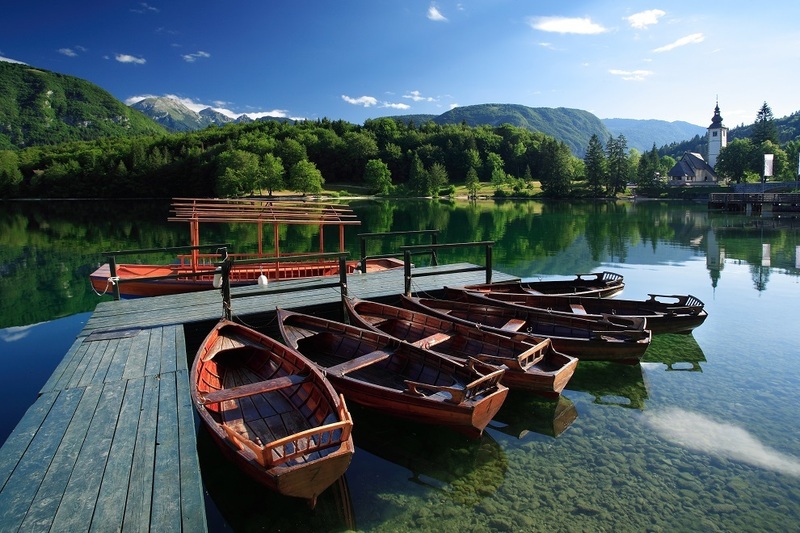 Explore the stunning scenery of Lake Bohinj and Lake Bled, located in the beautiful alpine region of the country. 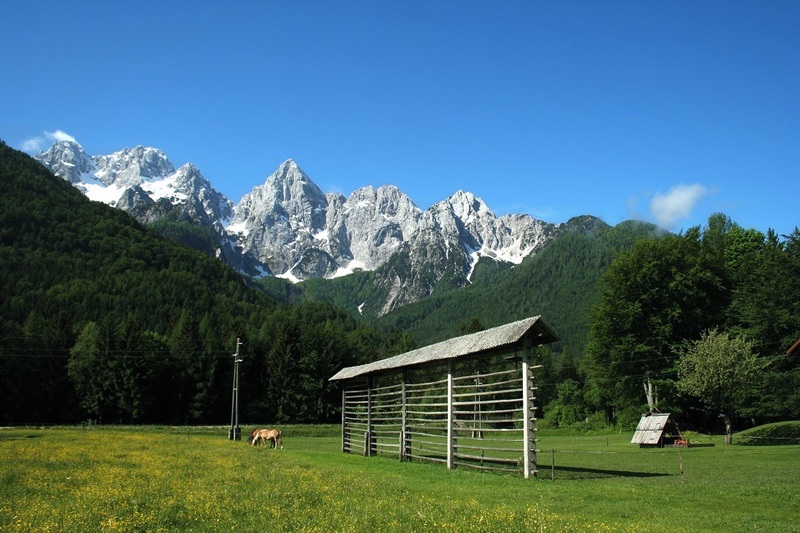 Visit Kranjska Gora, a lovely alpine village with a thriving local mountain biking community. Its great location in the heart of the Alps is just a stone’s throw away from Italy and Austria. 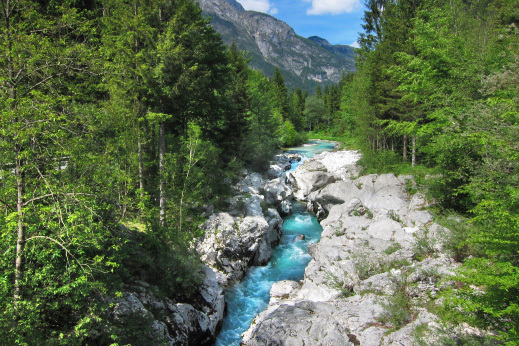 Discover the emerald waters of the Soca River and spend some time in Bovec, Slovenia’s premier outdoor center. Enjoy a delicious visit to Hisa Franko, the family-run countryside inn and restaurant where Slovenia’s best chef Ana Ros makes magic happen. Ana received well-deserved global recognition after appearing in Netflix’s series Chef’s Table and was chosen as the World’s Best Female Chef in 2017. Bike to the Slovenian wine country of Brda and spoil yourself with world-class wine and fabulous dining after a day spent on the mountain bike. Finish the tour in Piran, a charming town on the Adriatic coast dating back to the times of Venetian republic. · Other departures upon request from June to September. Riding the trails near Ljubljana. Enjoy your breakfast and morning coffee in Ljubljana before meeting up with your guide and your fellow mountain bikers for a briefing, then prepare yourself for the first ride of our week-long adventure. 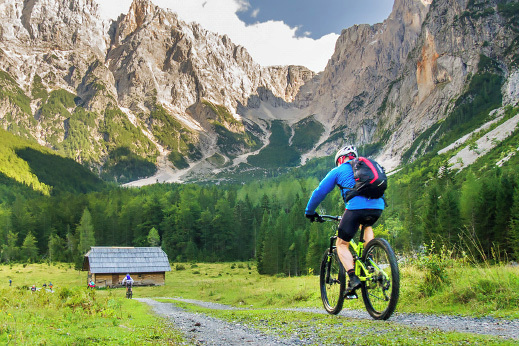 The green capital of Slovenia is surrounded by hills which offer countless trails for all skills levels – all within a 15-minute ride from the city center! You will spend your first day like a Ljubljana local, biking on trails that many local weekend warriors escape to after a long week. You will even finish the day as a true local – with some cold drinks by the Ljubljanica River, followed by a tasty dinner. After a day like this it’s not hard to understand why so many passionate mountain bikers feel lucky to live in the capital of Slovenia! Today’s ride: we’ll do an easy warm-up ride out of town, with a mixture of wide forest trails and singletracks. Nothing too steep, nothing too technical, but some roots can be expected in the woods. This morning we leave Ljubljana and are driven to the Alpine region, where we will ride and stay in the heart of the well-preserved Triglav national park. Views of the Bohinj Lake are stunning, but this will not detract our focus from cycling. We will bike (or drive) to the plateau above Bohinj Lake to admire the surroundings of the high alpine peaks, lush meadows, and old traditional wooden houses. We descend from the plateau on old World War I military “mule trails”. We spend the night by Lake Bohinj and treat ourselves to some of the best trout, prepared according to the local recipe. Today’s ride: you can expect a slightly longer climb on a combination of paved and gravel road with a relatively constant/gentle gradient. Once we reach the top of plateau we are immediately rewarded with spectacular views and a long descent on an abandoned WWI military trail. Downhill is rated as “easy” as it mainly follows fast double and singletracks spiced up with some nice open switchbacks. Climbing up on the old “mulatierra” path, built by Russian solders during WWI. During the short morning drive we stop at Bled, one of Europe’s most scenic spots. We get the chance to take a photo of its picture-perfect setting and try the local dessert, Kremsnita cream cake. Afterwards we start riding (or continue in the van) towards the northern side of Triglav National Park. The climb to Vrsic Pass has 24 switchbacks and is the highest road in Slovenia, built during World War I by Russian prisoners. 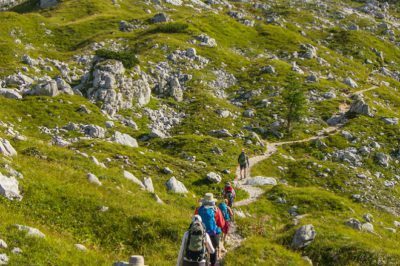 This old road will take us up into the rocky formations of the Julian Alps, where we will enjoy breathtaking views and traditional mountain food served in the mountain huts: hearty stews, sauerkraut and sausages, all hearty food that will help you regain your energy. The morning’s climb will be rewarded by a long descent back down to the valley, following scenic singletracks along the river and surrounded with spectacular pristine nature and 7000ft peaks. We will finish the day with some delicious local food and well-deserved rest in the world-famous ski resort village of Kranjska Gora. Today’s ride: the morning climb is mostly on a rough paved road with 24 switchbacks. It was built during WWI as a supply road, so you can expect a steady gradient with some historical sights all along the way. This is a “must do” for every Slovenian cyclist, and once you get above the tree line you will understand why. 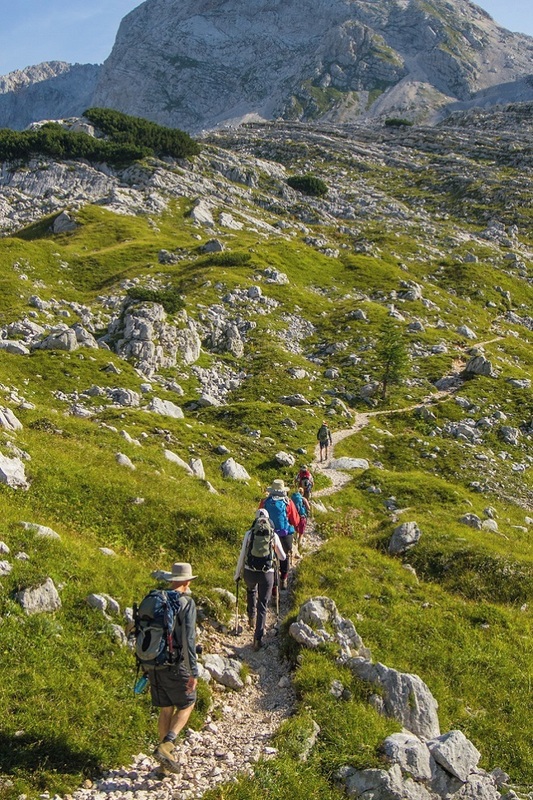 The descent will follow parts of the original road which is now a pleasant singletrack surrounded by dramatic rock formations and alpine vegetation. 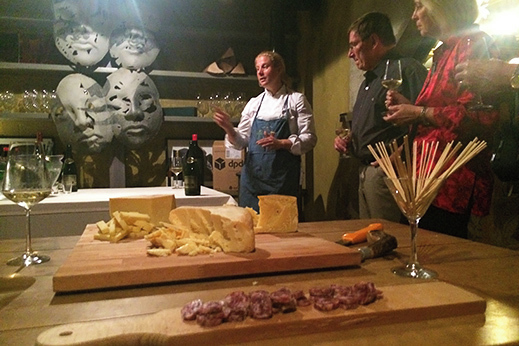 Cheese and wine tasting with Ana Ros at Casa Franko. After a hearty breakfast we drive to Soca valley, which is heaven on earth for every outdoor enthusiast. It was here where the biggest and bloodiest battles of the First World War took place. The remaining military trails are not just reminders of dark history – nowadays they also offer us, mountain bikers, a convenient approach to the mountains. Some of those paths were long forgotten and overgrown until they were found and resurrected by cycling enthusiasts. That is why today’s gentle gradient on newly renovated singletracks can’t fail to put a big smile on your face. The day will end on a high note, with a visit to Hisa Franko, where we will enjoy the world-famous culinary repertoire of Ana Ros, the World’s Best Female Chef of 2017, accompanied by delicious wine from her husband’s wine cellar. Today’s ride: We will drive up the mountain for a while and then hit another WWI mule trail which will take us to the top of the ridge. Today will be a quieter day: we will climb on a rough gravel road surrounded by beech woods. As you might have guessed already, we will be rewarded yet again by spectacular views of the Alps to one side, and the Adriatic coast on the other. Simply beautiful! It’s all downhill from here on: a long descend into the valley and to the family-run country inn where we will spend the night. For the descent you have the choice of a wide double-track with open views down the valley, or a 10km (6mi) singletrack deep in the forests. Soca river – natural treasure and the “mecca” for adrenaline water sports enthusiasts. After breakfast and coffee we start riding straight from the hotel gate. Today we will not climb high mountains as we opt for a more relaxing day in the lower parts of the valley. We will ride through small traditional Slovenian villages, cross some narrow hanging bridges, ride along the emerald-green Soca River and maybe even go for a swim in the pleasantly warm Nadiza River. We will also explore some local singletracks in the nearby forests. Lots of fun is guaranteed, and there is no better way to conclude this day in the saddle than with some craft beer form a local brewery. After a short rest we drive to the wine region of Goriska Brda, which looks like Tuscany with a Mediterranean flair. A glass of wine accompanied by a traditional home-made meal of home-grown veggies and local meat will give us a chance to reflect on all the beautiful trails we rode so far. Today’s ride: beautiful trail next to the river turns into a short downhill section before it hits one of the suspension bridges. We will ride through the fields, listening to the cow bells and admiring the high mountains and rivers all around us. Forest singletracks will break up the pace from time to time and we might also find some short, technical downhill sections. To sum it up: today has something for everyone! This morning we drive closer to the coast to do another epic ride, this time overlooking the Slovenian karst region. After reaching the top of our first climb astonishing views of the Trieste gulf and the Slovenian coast will open up bellow us. On our way down we will pass by some of the traditional Slovenian karst villages and admire the unique rock formations that are characteristic of the area. 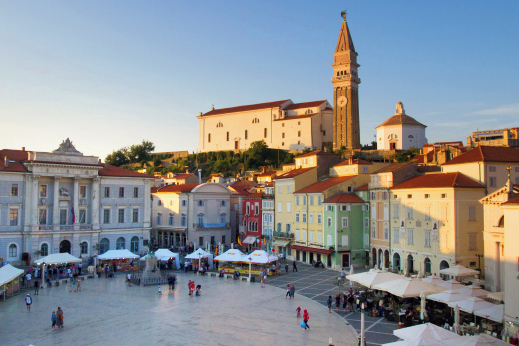 We will finish our day by the Adriatic Sea in the medieval coastal town of Piran, whose narrow streets and tiny Venetian-style piazzas offer the perfect finale to an amazing week spent riding some of the best Slovenian trails. A quick jump into the Adriatic Sea and some fresh seafood and other Mediterranean delicacies for dinner will end the day in style. An amazing week like this merits a farewell toast to many more to come. Today’s ride: our climb starts on paved road which soon turns into a gnarly paved road that takes us up to the top of the hill. From there it’s a long winding singletrack with a few jumps and chickenways on the way. “Wow” factor of excitement guaranteed. We conclude our week-long adventure with one last scenic ride. It is a unique experience to ride the ridge bordering Croatia, with some phenomenal views down to the Adriatic coast and into Croatian Istria. At times you can even see as far as Venice and the Dolomites on the Italian side! Slightly rockier trails and Mediterranean vegetation will provide a complete change of scenery compared to our previous days. Afterwards we will take a shuttle back to Ljubljana, where we will arrive around 5.00 pm. Today’s ride: the ridge is reached after an easy and steady climb on a rough gravel/jeep road. Our road joins the singletrack on the ridge. It is a meditative ride through grass fields, with spectacular views on both sides. Trail is perfectly rideable, with some short challenging climbs followed by relaxing descents. There might be some short hike&bike sections, but that will only give us more time to stop for a second and enjoy the moment. From the edge of the ridge the final descent on a rocky singletrack will take us back to the beginning of the day’s loop. PRICE of tour Please contact us! 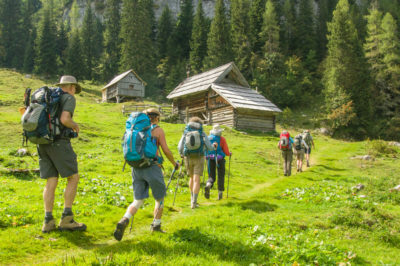 1:5 TrekTrek guide to guest ratio. price pp dbl occ varies depending on the size of the group – please contact us for more information.